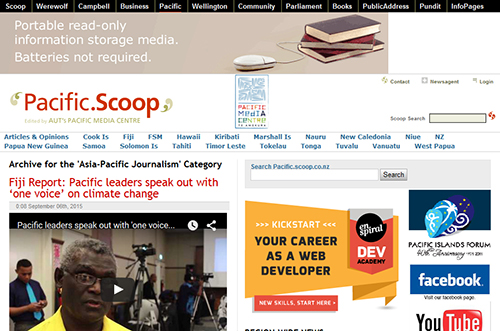 Independent Pacific news, analysis and commentary Pacific Scoop is a regional “hub” partnership venture between AUT's Pacific Media Centre and the independent news portal Scoop. The centre is based in the School of Communication Studies where postgraduate Pacific student journalists and other media students with an interest in Pasifika affairs will be filing regular stories. 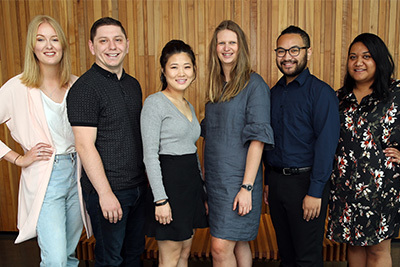 Students on the JOUR801 Asia-Pacific Journalism Studies postgraduate paper use this news website as their main course outlet. Other students on regional and international internships will be reporting too. The idea is to produce a distinct blend of news, current affairs and analysis – a fresh and independent “voice” of the Pacific. We are keen to tell the hidden stories and address justice for the marginalised. Education, culture, creativity, environment, health, human rights, media, social justice, resource development, regional security and technology are just some of the topics high on our reportage list. Supplementing our daily file from students are articles by academic staff, regional journalists and civil society advocates and analysts. Together with AUT, the Divine Word University in Madang, Papua New Guinea; National University of Samoa; and University of the South Pacific journalism schools will also be filing stories, images and multimedia for Pacific Scoop. We also have a link with the Reportage-Enviro student website at the UTS Australian Centre for Independent Journalism (ACIJ), which is committed to “promoting an alternative voice in the global environmental debate with news that challenges consensus or raises awareness on under-exposed issues”. Backgrounder on the Pacific.Scoop vision here.